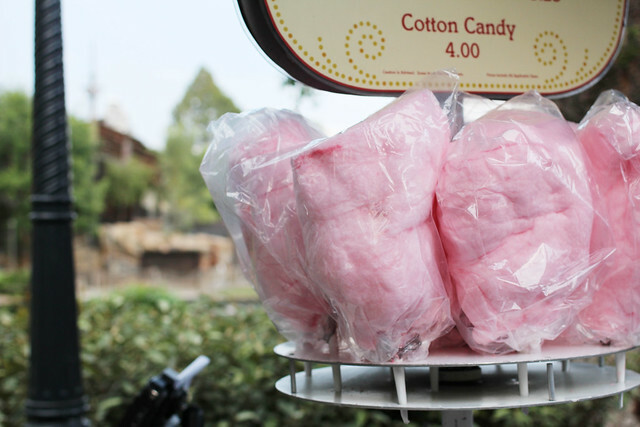 Sometimes Sweet: Disneyland, Day One! So last week we drove the 360 miles to Disneyland to spend a few days soaking up the California sun and get in one nice long family trip for the three of us before Charlie makes his arrival come August. 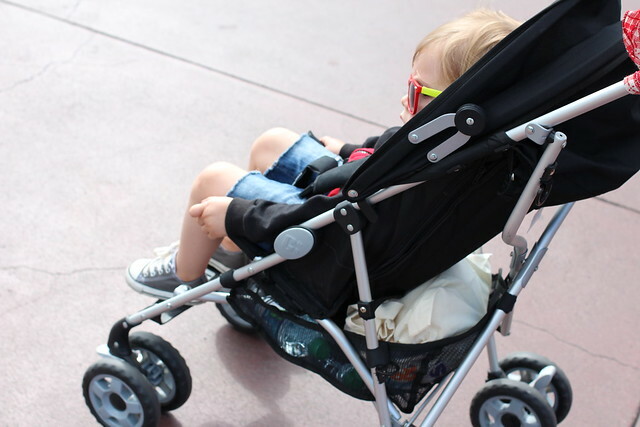 We've been looking forward to Henry's first Disneyland visit forever, and although some people like to wait until kiddos are a bit older, we felt like this would be the perfect time (and it was!). 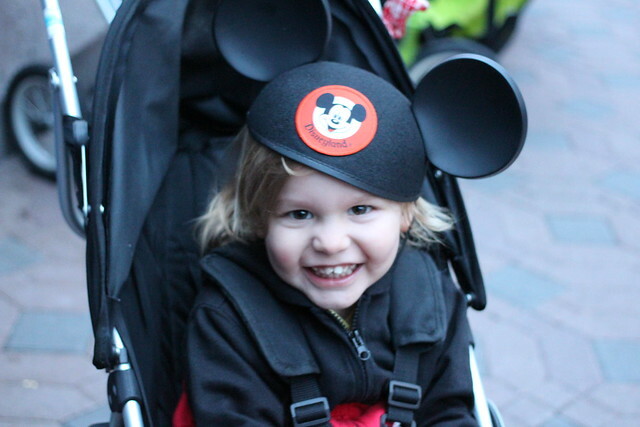 He's is very into a few specific Disney things- Dumbo and Casey Jr. (the circus train in the movie), The Mickey Mouse Clubhouse, and Captain Hook- so he was beyond excited from the moment we told him about our Disney plans. 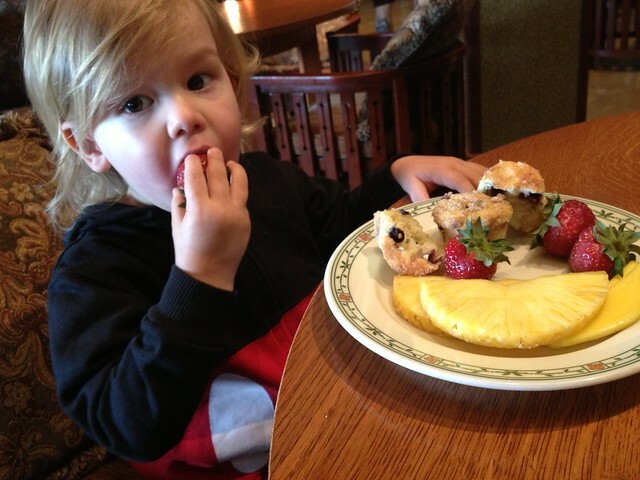 We decided to stay at the Grand Californian for a few reasons, but the main being that it is right inside the park (we had a special entrance right into California Adventure- so convenient!) and it was super easy to walk back for Henry's naps. We met Hank's Dad and Step-Mom there too, and they liked the accessibility to the park and were won over with just how close the hotel was to everything. So great! We left for CA right when Hank got off work, and our main goal was to make it to Blythe by 6pm so I could be sure to have good phone service during a Twitter chat I was hosting. We made it on time, and Hank took Henry to play in the McDonald's Play Place while I spent an hour tweeting. I was relieved we made it because the week before I was so nervous about driving through such a bad cell-zone when I had a long-standing commitment. So happy when it was done, and it was at that moment I felt like vacation really started! 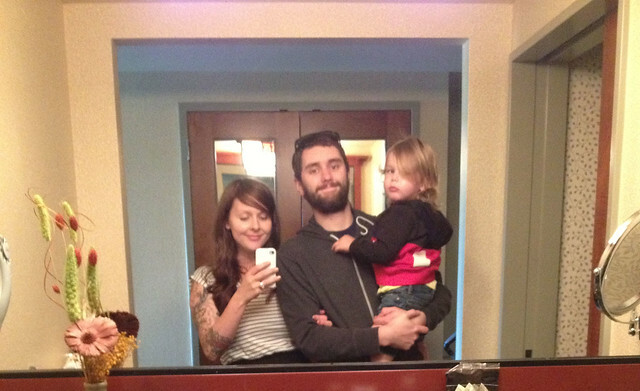 We didn't make it to the hotel until about 10pm and Henry decided not to sleep at ALL during this time. He's normally a great sleeper and has no problems snoozing in the car, but I think he was so amped up that it just wasn't an option. And that "amped up-ness" lasted all the way until 3am! Ahh! So, so crazy for a little one (and hello, us!) who rarely goes to bed past 7:30pm. He doesn't like sleeping in bed with us, so we brought his pack 'n play, which was also a problem because he never uses that either. But alas, at 3am he finally fell asleep. 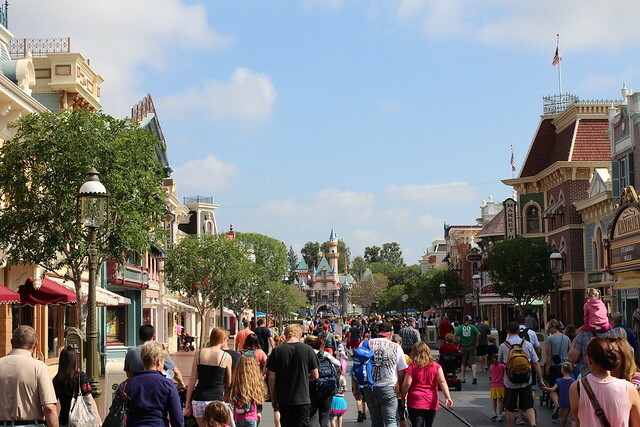 We woke up around 7am, grabbed breakfast quickly and headed over for our "Magic Hour," which is an alternating early entrance into Disneyland or California Adventure that came with our hotel/park-hopper package. The first day our early entrance was into Disneyland so we hightailed it over there and enjoyed a really empty park for the first hour. 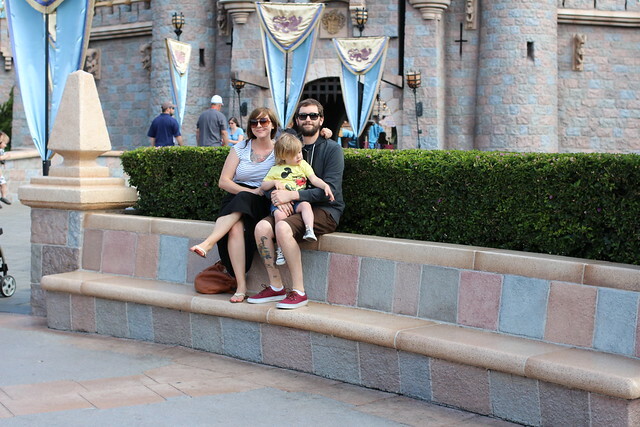 I'm not sure if all of the areas were as empty as Fantasyland was, but we really wanted to do all of the things Henry was most excited for first, so it was perfect. 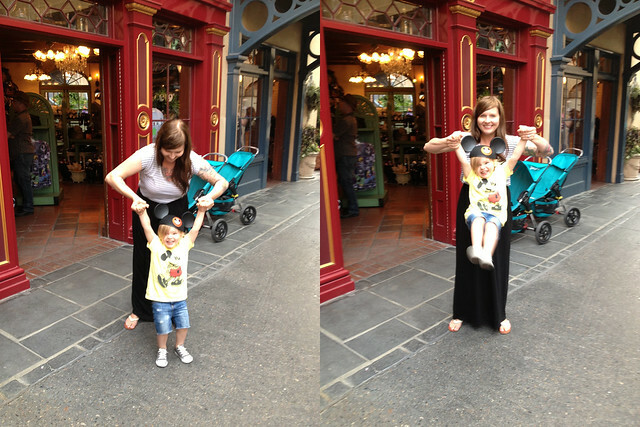 His very first ride was Dumbo and he loved it. I'll never, ever forget his face the first time we went high up in the sky and of course I teared up a bit. I loved that all three of us could ride together, and it was just really, really special. Afterward we headed over to the Casey Jr. Circus Train which we ended up riding a few times in a row, and this ride actually turned out to be a Henry favorite for the entire trip. 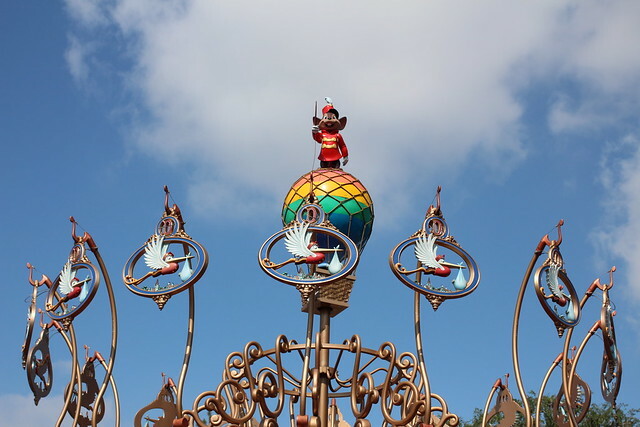 The rest of the morning was spent going on the rides in Fantasyland, all being a success with the exception of Mr. Toad's Wild Ride (he HATED it...and seriously, does that ride take you through hell?! So weird.) And as always, we tried to do the carousel and as always, he hated it after 5 seconds up on the horse. 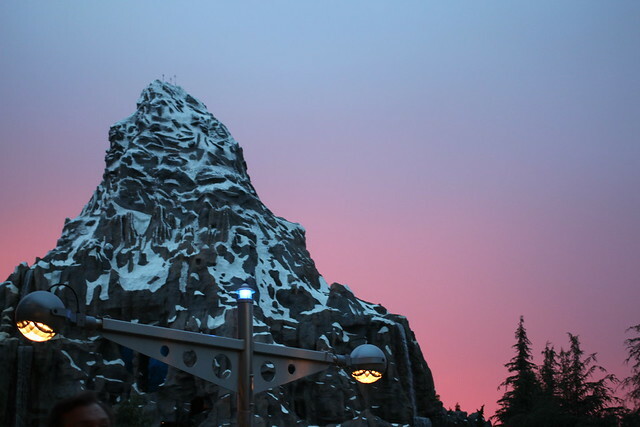 After a morning of rides and exploring and walking around, Henry and I went back to the hotel so he could nap and Hank and his Dad grabbed fast passes for all of the things a pregnant woman and a toddler can't enjoy (like my very favorite ride, Space Mountain! ), and they rode while Henry slept and I relaxed and read. 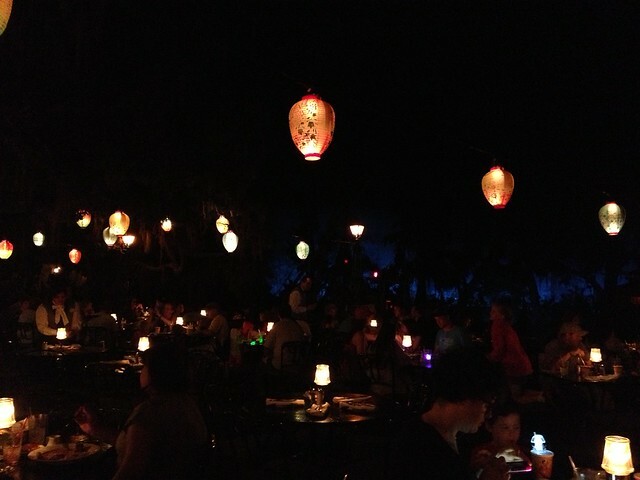 Once he woke up we all went back into the park to make it for our dinner reservation at The Blue Bayou. I have been wanting to eat there forever, so I was really excited to finally try it! If you're not familiar, it's the restaurant inside of the Pirates of the Caribbean- the one the boats all float past during the ride. 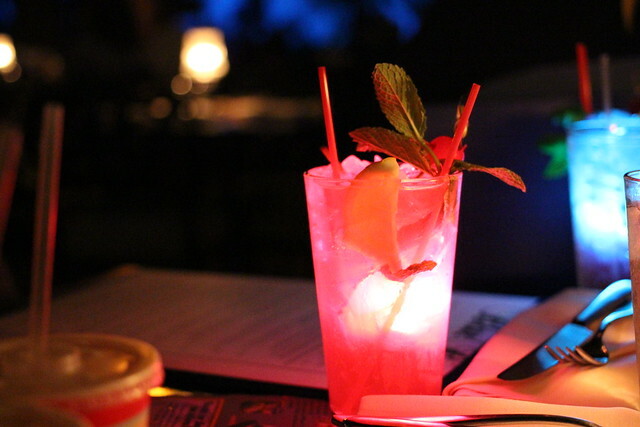 While eating it really feels as if you're dining outdoors, right along the water, and it's truly magical. I got the Surf 'n Turf and both my filet and lobster were SO good. They also bring out some bread before and I think Henry and I could have eaten basket after basket of the sweet potato ciabatta. We were all really happy with the food, and left smiling and super full. After dinner we rode the train around the park a few times. 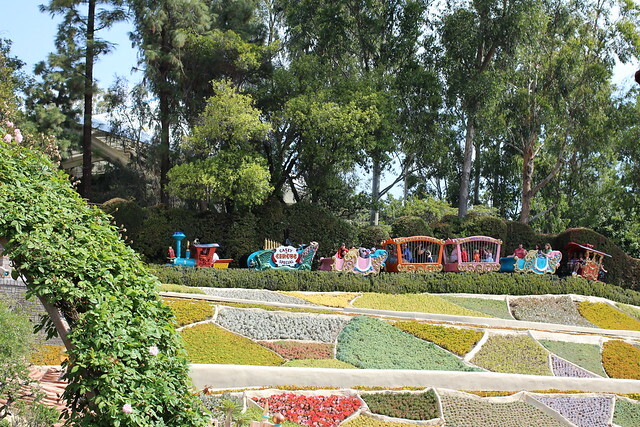 Seriously, if Disneyland was just that train, Henry would be ecstatic. Even though I've been to Disney a few times I've never been on the train and I'm so happy we discovered it thanks to some advice from friends with kids. Henry was happy as a clam, and it was a nice way to see more of the park. It's a great thing to do with little ones, for sure. At the end of the night we all got churros (an every night ritual), then headed back to the hotel to watch the fireworks from the balcony. All in all...considering Henry was running on a measly THREE HOURS of sleep in the beginning, it was a successful day! 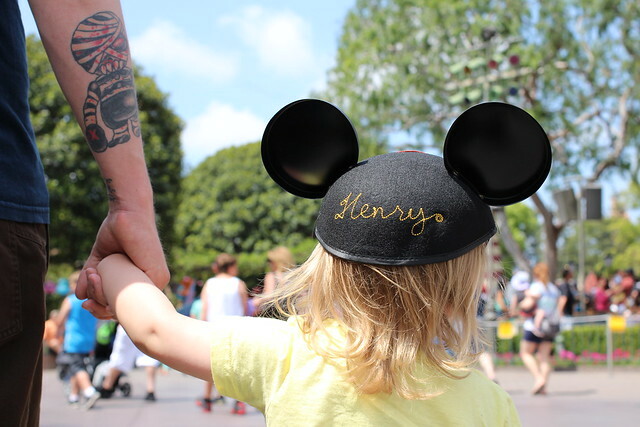 And for those who have been asking about Henry's Tattooed Mickey shirt, the wonderful folks at Hatch for Kids sent it to us, and you can find it here! How fun. We were just there in Feb, and had a magical time. Oooh god! 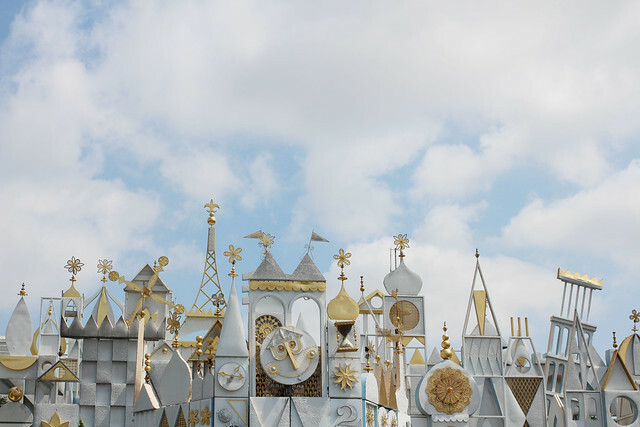 I never went to Disney World or Land as a child, but going to theme parks alone was amazing and I remember having the best time ever with my parents and siblings! Henry must enjoy this looaads! Disney is so fun. Since having kids I have gone several times. 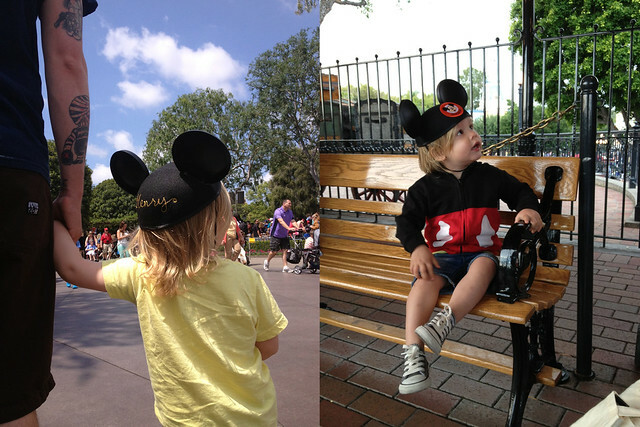 I too also have the quintessential photos of the back of the kids head with the mickey ears. I love those shots the best! Oh this just warms my heart! My family went to Disney World when I was 18 and we've been dying to go back ever since. There's nothing like it! He looks like he's having a blast! Looks like so much fun. I'm a Florida girl, so Disney World was our family vacation most years. 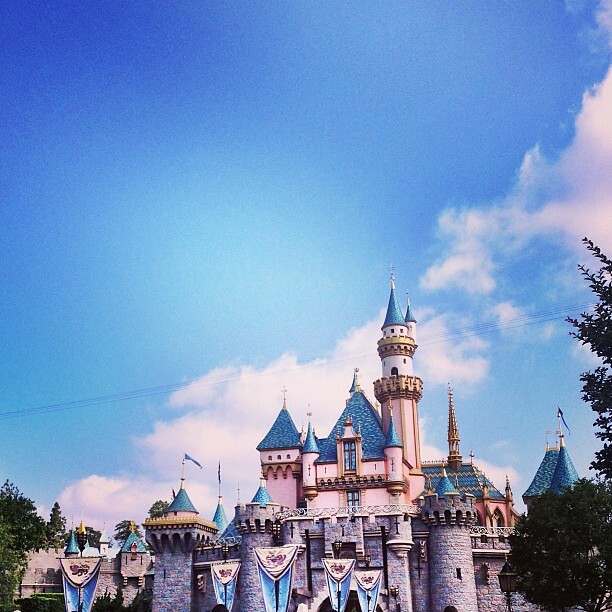 Now seeing all the pics of Disneyland, that castle just seems so small. It looks like you had so much fun!! I'm going to take my partner next year, its not his thing but how can you not enjoy it! Such a beautiful family! And Henry is looking so big! Handsome little man! looks like so much fun! i haven't been there since i was 8 years old. 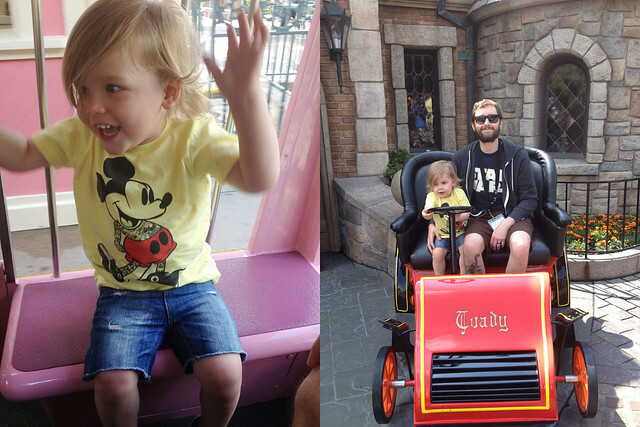 when Ryan and I start having kids old enough to enjoy Disney world, i totally want to take them there! 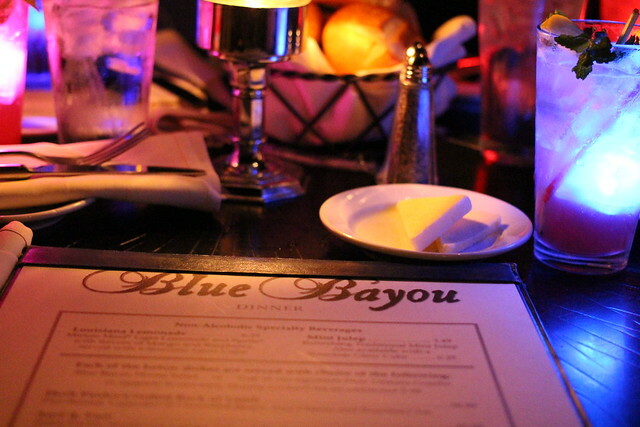 I love your photos and I am super jealous that you did The Blue Bayou and stayed at the Grand California. Those are two of my Disney Bucket List items. We went in November as part of our Honeymoon. It was so much fun! we ended up taking the train so many times because I had cut open my foot a week earlier. Even though we went all the time as kids, I don't think I had ever ridden it all the way around until then. I have been looking forward to these posts! You guys are so cute. great post! 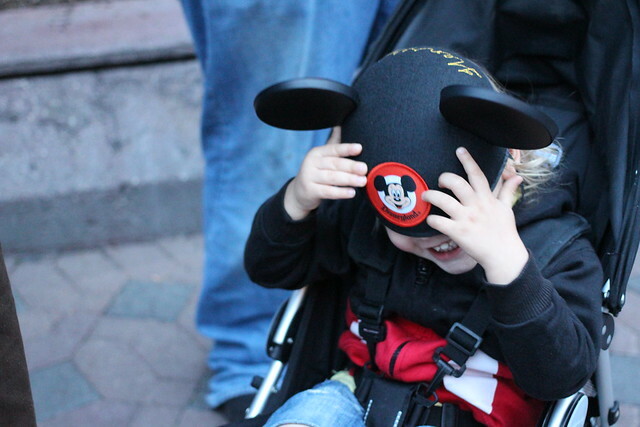 There is something so amazingly special about a child's first time experiencing the Disney magic. I also remember being absolutely terrified of Mr.Toads Wild Ride, when I was a kid. Such a weird thing! Anyway, great post and I can't wait to read the next two! opportunities to listen to his music that are online. On April 5, 1986, Jean-Michel Jarre performed a legendary concert Rendez-Vous Houston: A City in Concert. Did Henry end up getting his "1st Time" pin? I have yet to meet a small child who actually enjoys Mr. Toad's Wild Ride through hell. Gets warm and everything! Creepy. they don't have a mr. toad ride at disneyworld, but they do have a winnie the pooh one that was pretty terrifying. it's supposed to be pooh's dream, but i swear it's more like pooh's bad acid trip. 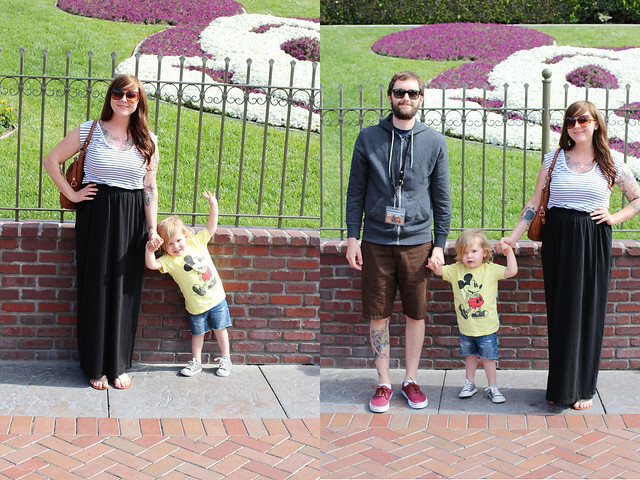 we went to disneyworld in march, and it's kind of neat to compare just how different the two parks look from your post. The most exciting part of the event is now here on June 17th, pick up cheap neverwinter astral diamond on safewow and prepare yourself for war now! Safewow neverwinter astral diamond is the cheapest online with 100% manual work quality! Fast delivery comes in 15 minutes!